The Orangefield Junior High Student Council and National Junior Honor Society have teamed up with “Hats Off For Cancer” to raise awareness for pediatric cancer. For the past three Fridays, on each campus, students were invited to donate either a new hat or $1; in exchange, they could wear a cap during the day at school. So far the school district has raised $1,152.43 and collected 265 hats. “This is a cause that is close to many of our hearts. We wanted to help out in any way possible. I am proud of these kids.” said Principal Preston Clark. Two sixth graders, Alexis Sturrock and Madison Taylor, were especially motivated to make a difference in the lives of cancer patients. Madison donated 123 hats and Alexis donated 118 hats. Alexis collected the majority of her hats from her grandmother Debra Sturrock, owner of Jubi Prints in Vidor and Madison worked closely with her mother, Evelyn Taylor, owner of Center Stage Boutique in Orange, collecting hats. Madison and her mom participated in the campaign last year and plan to make it an annual tradition. The hats and monies will be donated to Texas Childrens Hospital. The two junior high organizations will continue to take contributions until the end of October. Donations can be mailed to the campus at 7745 Sandbar Rd. Orangefield, Tx. 77639 or dropped off in the office. “Hats Off For Cancer” collects and donates hats of all kinds to the courageous children who lose their hair due to cancer treatments. As one of the leading and original hat programs, Hats Off For Cancer has donated more than 1.5 million brand new hats to hospitals, camps, and individuals worldwide since 1996. The program was founded by Tara Lawrence at age 14 after losing her grandfather to prostate cancer. Attending fundraising events for cancer research, Tara met kids her age who were battling cancer. The children told her over and over again how much they hated to lose their hair. After hearing this from so many children, Tara knew she could do something to help. In 1996, she began writing letters to companies, sports teams, and celebrities asking for the simple donation of a hat. The charity received more than 1,000 hats in the first three months, and has grown in the past 16 years to help more than 1.5 million children and set up drives on five different continents. Still run as 100 percent volunteer, all funds go directly to purchasing, storing, and shipping hats, as well as helping cancer patients’ families in need, and running the Mad Hatter drive events around the world. “Hats Off For Cancer” is recognized by the IRS as a 501(c)3 non-profit organization. 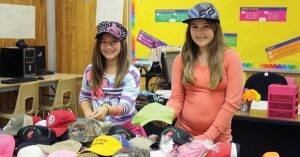 Photo: OJH sixth graders, Alexis Sturrock and Madison Taylor, organize hats they collected for cancer patients. Ways to get involved during September’s Childhood Cancer Awareness Month! I have been receiving a lot of emails from schools, groups and companies, asking how to help spread awareness during September for Childhood Cancer Awareness Month. I thought it might be good to address that here on the blog. First, check out our Get Involved section on the Hats Off For Cancer (HOC) Web site if you know how you want to help. If you’re still unsure, keep reading. One of the easiest and more impacting ways to get involved is by hosting a Mad Hatter Drive at your school or church, in your community, with an organization or at your place of work. There are a ton of different ideas for your drive listed in our e-packets. Some that have been very successful for groups in the past include designating a “Hat Day” where you collect a $1 donation from each person that wears a hat for the day. Another great idea for an elementary or middle school is asking everyone to bring in their craziest hat and put it on during an assembly, asking for a $1 donation for HOC, and then holding a “Hat Parade” outside so everyone can see the fun hats and handing out prizes in certain categories! You can host a Mad Hatter tea party and charge admission, either a new hat or a couple of dollars. Hat drives are also a great way to give back, asking everyone to bring in new, kid-friendly hats to give to HOC. Some groups have held a Battle of the Bands or a local concert after school or at church and used the admission fees to donate to HOC. High Schools and Colleges have challenged rival schools to a competition to see who can raise the most money or collect the most hats. Contact your local grocery store about partnering to ask patrons to donate $1 and they can write their name on a hat cut-out and post them up in the store display area. Church groups and civic organizations and groups can knit or crochet soft hats. Schools have used assembly time to show the HOC PSA and music video as a way to help everyone understand a little more about cancer and who is being helped through volunteering for Hats Off For Cancer. Companies can give workers additional casual day passes for those that have participated in a donation or hat drive, or hold a golf outing with your company as the sponsor. Everyone can get involved by hosting a virtual fundraiser through our online donation page where you can set up your very own page for Hats Off For Cancer and send the link out to family and friends. You can find more ideas based on your type of group and event by visiting the Get Involved section of our Web site: Get Involved. Truly, the opportunities are endless. However, the most important part to remember is that you’re helping to spread awareness of this terrible disease, and you’re encouraging others to donate in a very simple, but in a way that is very meaningful and important to those benefiting from it. Ultimately, one of the goals of Hats Off For Cancer is that everyone who participates in or coordinates an event, realizes how easy it is to give back, and uses this as a springboard to continue seeking out opportunities to give back to others in need. Here is a fun way to promote awareness. Just share this photo on your facebook page or tweet it to your followers! Remember, getting involved can be as easy as you want it to be, but the impact can be felt for the rest of your life. Thank you for reading and we hope you’ll consider joining us in bringing some much needed awareness to the courageous kids and teens who are battling and have battled cancer! 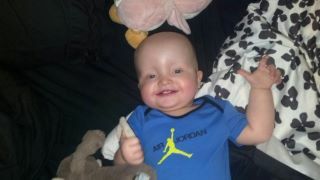 This week we want to honor 1-year old Rowdy Perkins. 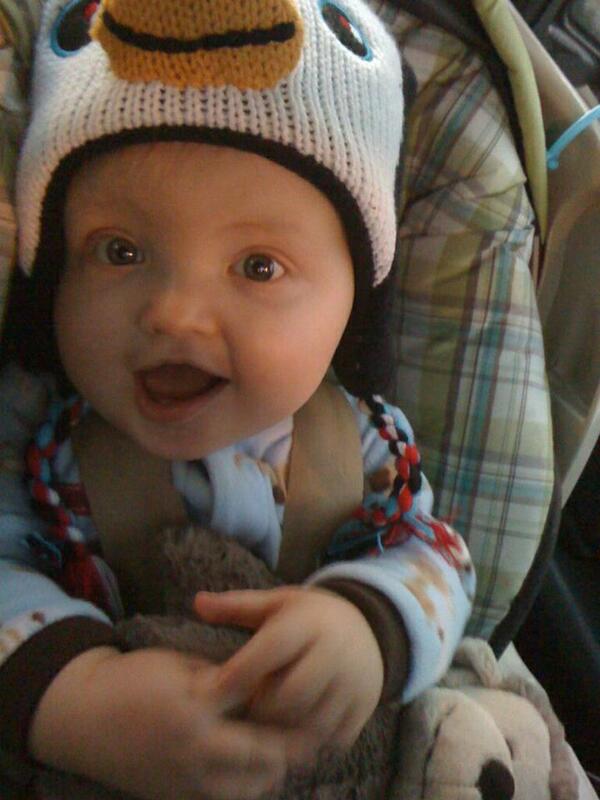 Rowdy was diagnosed with 4S Neuroblastoma at less than a month old. He started chemo and underwent four rounds as well as two surgeries to remove remaining tumors. To us Rowdy is a real hero, we have learned soo much from him in the past year. It is sad that Rowdy’s life so far has been filled with this hell, but we know how lucky we are that he was able to battle this beast and come out smiling and HEALTHY! Happy and healthy! 1-year old Rowdy shows off his smile! On July 1, 2011, Rowdy ended his treatments. His most recent scans in February came out clean! Congratulations Rowdy! We honor you as our HOC Hero of the Week! Check out his CaringBridge page and leave a message for him and his family! This week we are honoring 1-year-old Logan Munro, affectionately known as Loganberry and Logie Bear. Little Logan is battling a form of malignant brain cancer known as Medulloblastoma. You can help him and his family by clicking the links at the bottom for his personal donation page! 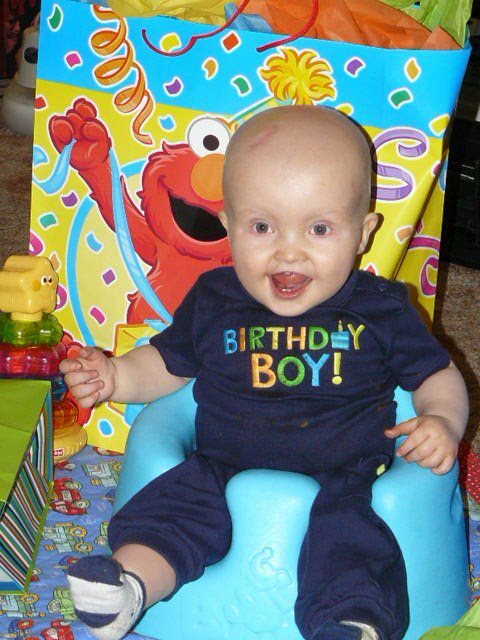 Logan was born in February, 2011 and at his three month check-up, his doctor noticed his head was large for a baby his age. Those concerns grew when Logan was not meeting certain milestones in development. After a brain scan and biopsies, it was determined that Logan had five tumors. He underwent surgery in December 2011 to remove one tumor. The others were too large and now Logan is undergoing chemotherapy to decrease the size of the others in order for the doctors to operate. Throughout it all, Logan continues to be a loving and happy baby. Logan is such a vibrant little boy who almost always has a smile on his face no matter what he is going through (In fact he recently was admitted to the ER and eventually isolation due to a fever and extremely low blood counts and except for when they were accessing his port, was smiling at all the nurses and doctors). Between treatments, Logan is a happy baby who turns up the wattage on his grin when he sees his toy tow truck, watches Baby Einstein on TV or finds an adult with whom to flirt. You can show your support for Logan via his Facebook page and donation site. “Like” Logan’s page and show him and his family that we are thinking and praying for his health and recovery! Alex loves her Minnie Mouse hat! We received this in our inbox from Brittany! Please check out Alex’s web site. My niece Alexandria (Alex) loved her Minnie Mouse hat! Thank you to our donors and supporters that make Alex’s smiles possible as she shows off her new hat.